Casa Paco in Paris was a new discovery for me today. I just went off for a quick lunch with my boss and she suggested this tapas bar which looks so typical Spanish. I can recommend the tapas in general and the ham and the fried fish in particular. I did not taste the paella but from the look it had I would not be inclined to order that one. On the other hand, they had nice fresh sangria and a friendly atmosphere with a decoration that could be in Sevilla or Cordoba. Overall it makes a good experience and a nice new thing when walking around Paris. 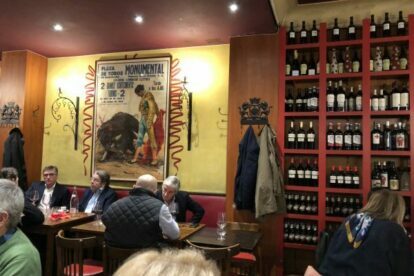 We ordered 4 different types of tapas (ham, croquettes, cheese and fried fish), sangria and coffee, and all of it came for a decent price, if you take into account that we are in the 16th neighborhood of Paris and that this is a bit of an “exotic” eatery here.